I wanted to update you all on my great market trip!! This year I went for two days and enjoyed both of my daughters’ company both days! Market really provides a boost of creativity! My daughter’s friend, Natalie, owns Smith’s of Dublin, and while at market, we were able to meet and chat about her store and customers! It is great to hear how other small town business owners work to meet the demands, wants and needs of their customers. It was fun to discuss products and event ideas as well. Natalie completely renovated and upgraded her store, so if you are in the Dublin area, you should check it out! As many of you know, I have a love for nice linens, and I have been on the search for fringed cocktail napkins- FOREVER! I am SO happy to let you know that I am finally bringing fringed cocktail napkins to Lilly T. Grace. I am ordering these beauties from Linen Way along with some other classic dish and hand towels. I will load pictures as soon as they arrive! Oh Mint added a round travel/cosmetic bag and a smaller cooler bag that will make the cutest lunchbox! They also added the color white! How fun would a white travel or cosmetic bag be for a bride!? We are already thinking about adding “Bride” or “Mrs.” to these new white bags! Lastly, we are adding the Lisi Lerch Margo to our jewelry line! 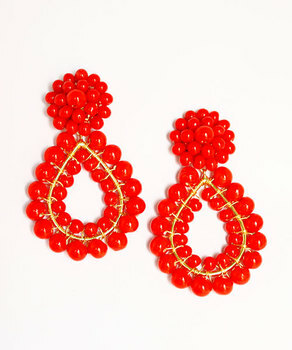 This earring provides the perfect pop of color! Because we will be receiving the Margo soon, a few of our Lisi Lerch pieces are on major sale! Check it out at www.lillytgrace.com!